Over thousands of enthusiastic "post-treatment" statements put into a nutshell: " The most refreshing quarter of an hour since the advent of massage." On-site chair-Massage at it´s VERY best: Professionally seated, treated and relaxed and all this in an environment that is pleasing to your eyes, ears and nose. We care for an appealing atmosphere as well as for the state-of-the-art DYNAMIC massage and good-looking masseurs. Mobile massage at demanding and tiring exhibitions, trade shows, open-house days or incentives - events where you present your company, products and service: allow FITalis to pamper your clients or staff and bring them back into a revitalized condition with new energy resources eager to concentrate on what they are supposed to. Our mobile massage-team can also be booked for a short-time service, e.g. for leisure events such as business or private parties. Delight your guests with a wonderful refreshing massage instead of traditional "give-aways" ! 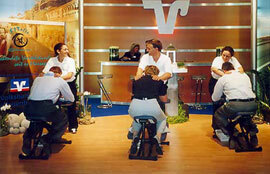 On-site-Service such as office-massage is also available in many German cities. FITalis mainly offers the service in German-speaking countries - however - our staff is able to cover all other European regions as well. Our masseurs are multilingual and speak English, French, Spanish, Italien, Swedish and Greek.